John Hicks had 2 hits including his 3rd homer of the season last night. Hear from John Hicks after last night’s 11-3 win over the Barons. TODAY’S GAME: the Generals continue a homestand tonight with game #2 of the 5-game series against the Birmingham Barons. 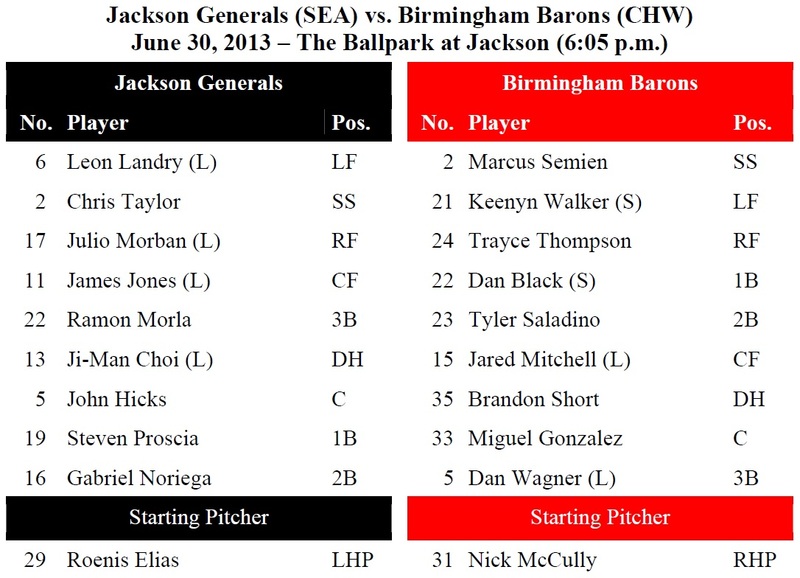 This is the 3rd series between the North Division rivals with Jackson leading the season series 6-5… 24-year-old Roenis Elias makes his 15th start for the Generals and 3rd of the season vs. Birmingham. This is his 49th overall start in his pro career. Elias is 3-2 with a 2.01 ERA on the road as opposed to 0-5 with a 4.20 ERA at home. GENERALS RECAP: The Generals scored 10 runs between the 3rd and 5th innings as Jackson defeated Birmingham 11-3 on Saturday night. SS Chris Taylor (3×5, 2 R, 2B, 3B, 2 RBI) and RF James Jones (3×4, 2 R, RBI) each recorded 3 of Jackson’s 14 hits, while DH Julio Morban (2×4, 2 R, RBI), C John Hicks (2×4, 2 R, 2B, HR, RBI) and 2B Gabriel Noriega (2×4, R, HR, RBI) each recorded multi-hit games. 1B Ji-Man Choi (1×4, R, HR, 4 RBI) drove in a team-high 4 runs on a grand slam with 2 outs in the 5th inning. Starter Anthony Fernandez (6.0,7,2,2,0,5) recorded his 5th win of the season, allowing 2 run on 7 hits in 6.0 innings. RH Tyler Burgoon (1.0,0,0,0,0,0) tossed a scoreless 7th inning and RH Andrew Kittredge (1.0,1,0,0,0,2) tossed a scoreless 9th inning, while LH Kyle Hunter (1.0,2,1,1,0,1) allowed 1 run on 2 hits in the 8th inning. DID YOU KNOW?…that since 2008 the Generals have a 30-14 record against the Birmingham Barons in games played at The Ballpark in Jackson including 4 of 6 this season. NEWS & NOTES: 30 of first 75 games have been 1-run games (10-20) which is the 2nd in all of minors…42 of 75 games have been decided by 2-or-fewer runs (13-29) and 7 have been extra-inning games (2-5)…In games decided by 3+ runs the Generals are 20-13. • ALUMNI REPORT: Mariners SS Brad Miller was 0x5 w/ SB last night vs. Cubs and stole the second base of his career in the 1st…he is the 2nd player in franchise history to record a stolen base in each of his first 2 career games (also: Carlos Guillen; 9/6-7/1998 vs. BAL). Since 2000, he is the 4th player in MLB to steal a base in each of his first 2 games (Jay Bruce, CIN, 5/27-28/2008; Coco Crisp, OAK. 8/15-16/2002; Mario Encarnacion, COL, 8/26 and 8/29/2001). • SEATTLE GENERALS:...there are currently (6) players on the Seattle Mariners active roster that were members of the 2012 Jackson Generals (INF Nick Franklin, INF Brad Miller C Jesus Sucre (15-day DL), C Mike Zunino, RHP Carter Capps and RHP Yoervis Medina). In total, (9) 2012 Generals have made their MLB debuts and (3) 2013 Generals. (C Brandon Bantz, RHP Hector Noesi, INF Brad Miller). • #VOTE CHOI: For the first time, fans will determine the final player on both the U.S. and World Team rosters by casting their votes in the Futures Finalists ballot, available exclusively on MLB.com/futuresfinalists. Generals 1B Ji-Man Choi, a native of South Korea is one of the finalist for the World roster. • MILLER, WALKER TO THE FUTURES GAME: 2013 Generals Taijuan Walker and Brad Miller were selected to the Futures Game U.S. squad on Wednesday. This is the 1st selection for Miller and 2nd selection for Walker. • YOUNG GUN: 21-year-old OF Julio Morban is the 5th youngest player in the Southern League. Morban currently is 2nd in the league with a .314 batting average is 3rd in the league with a .495 slugging percentage. • MR. JONES…MR. JONES: OF James Jones has hit safely in 7 of his last 8 games, batting .344 (11×32) with 5 runs, 1 double, 2 home runs and 8 RBI. • MORBAN SL HITTER OF THE WEEK: The Southern League announced Monday that Generals outfielder Julio Morban was named the League’s Hitter of the Week. Morban batted .400 (10×25), with 3 doubles, a home run, 9 RBI and 6 runs scored during the week and opening series of the 2nd half against Mobile. Morban homered, doubled twice and posted a career high 5 RBI in Saturday’s 10-5 win over the BayBears at The Ballpark at Jackson. It’s the first hitter of the week for a General since Brad Miller the first week of the season. • THE THREE CAVALIERS: With the addition of INF Chris Taylor at the start the 2nd half, the Generals current roster features 3 former Virginia Cavaliers in Taylor INF Steven Proscia and C John Hicks. AAA Tacoma’s roster features 2 former UVA alums in pitcher’s Andrew Carraway and Danny Hultzen. Both were 2012 Generals. • NORIEGA’S SPORTS CENTER LOVE: The 6-3 triple play started by Gabriel Noriega to end game one of a doublheader on June 10th against Chattanooga was Monday night’s #3 play on ESPN Sports Center’s top 10 plays.